LeafSpring School (formerly known as Rainbow Station) offers childcare, early childhood education, school age recreation and one-of-a-kind summer camps at over 30 schools across the country and abroad. In addition to their excellent curriculum, each school has on-site registered nurses. Rainbow Station was rebranding as LeafSpring and knew that their website would be a key to future growth. 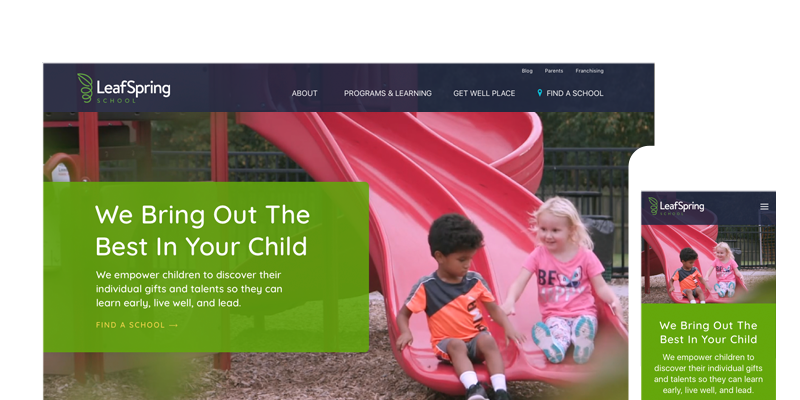 Helium was selected to create a youthful, energetic, and engaging website to connect with parents of young children. In addition to creating a strong visual design, we added robust features such as a location map search, photo & video galleries, blogging, and a looping background video to create motion. The site was built for optimal viewing on desktop, tablets, and handheld devices.